The biggest hits on Broadway are headed to Beantown as part of the just-announced Lexus Broadway In Boston 2015-2016 season! The blockbuster musical Beautiful: The Carole King Musical along with Cinderella and Matilda The Musical will be part of the upcoming season. The lineup will also include the Tony-winning revival of Pippin, If/Then and a brand new North American tour of The Sound of Music. In addition, subscribers can choose to add highly-anticipated engagements of two favorites: Disney's Beauty and the Beast and the always-popular The Book of Mormon! Learn more about all of these exciting stage hits below! Hailed by The New York Times as "the best musical of this century" and the winner of nine Tony Awards, The Book of Mormon is the blockbuster Broadway smash from South Park creators Trey Parker and Matt Stone, and the Oscar-winning composer of Disney's Frozen and Avenue Q, Bobby Lopez. This outrageous musical comedy follows the misadventures of a mismatched pair of missionaries, sent halfway across the world to spread the Good Word. Now with standing room only productions in London, on Broadway, and across North America, The Book of Mormon has truly become an international sensation. Contains explicit language. Rodgers & Hammerstein’s Cinderella is the Tony Award-winning Broadway musical from the creators of The Sound of Music and South Pacific that’s delighting audiences with its contemporary take on the classic tale. This lush production features an incredible orchestra, jaw-dropping transformations and all the moments you love—the pumpkin, the glass slipper, the masked ball and more—plus some surprising new twists! Be transported back to your childhood as you rediscover some of Rodgers & Hammerstein’s most beloved songs, including “In My Own Little Corner,” “Impossible/It’s Possible” and “Ten Minutes Ago,” in this hilarious and romantic Broadway experience for anyone who’s ever had a wish, a dream…or a really great pair of shoes. Beautiful: The Carole King Musical tells the inspiring true story of King’s remarkable rise to stardom, from being part of a hit songwriting team with her husband Gerry Goffin, to her relationship with fellow writers and best friends Cynthia Weil and Barry Mann, to becoming one of the most successful solo acts in popular music history. Along the way, she made more than beautiful music, she wrote the soundtrack to a generation. Featuring a stunning array of beloved songs written by Gerry Goffin/Carole King and Barry Mann/Cynthia Weil, including “I Feel The Earth Move,” “One Fine Day,” “(You Make Me Feel Like) A Natural Woman,” “You’ve Got A Friend” and the title song, Beautiful has a book by and Tony Award nominee and Academy Award-nominated writer Douglas McGrath, direction by Marc Bruni, choreography by Josh Prince, and took home two 2014 Tony Awards. The romantic Broadway musical for all generations, Disney’s Beauty and the Beast, the smash hit Broadway musical, is returning to Boston! Based on the Academy Award-winning animated feature film, this eye-popping spectacle has won the hearts of over 35 million people worldwide. This classic musical love story is filled with unforgettable characters, lavish sets and costumes, and dazzling production numbers including “Be Our Guest” and the beloved title song. Experience the romance and enchantment of Disney’s Beauty and the Beast at the Boston Opera House. Pippin is back on Broadway for the first time since it thrilled audiences 40 years ago! It won the Tony Award for Best Musical Revival! With a beloved score by Tony nominee Stephen Schwartz (Godspell, Wicked), Pippin tells the story of a young prince on a death-defying journey to find meaning in his existence. Will he choose a happy but simple life? Or, will he risk everything for a singular flash of glory? This captivating new production is directed by Tony winner Diane Paulus (Hair, The Gershwins’ Porgy and Bess). It features sizzling choreography in the style of Bob Fosse and breathtaking acrobatics by Les 7 Doigts de la Main, the creative force behind the nationwide sensation Traces. The hills are alive! A brand new production of The Sound of Music, directed by three-time Tony Award-winning director Jack O’Brien, is coming to the Citi Emerson Colonial Theatre! The spirited, romantic and beloved musical story of Maria and the Von Trapp Family will once again thrill audiences with its Tony, Grammy and Academy Award-winning Best Score, including “My Favorite Things,” “Do-Re-Mi,” “Climb Ev’ry Mountain,” “Edelweiss” and the title song. 2015 marks the 50th anniversary of the film version, which continues to be the most successful movie musical in history. TIME Magazine’s #1 Show of the Year! Winner of 50 international awards including four Tony Awards, Matilda The Musical is the story of an extraordinary girl who, armed with a vivid imagination and a sharp mind, dares to take a stand and change her own destiny. Based on the beloved novel by Roald Dahl, Matilda continues to thrill sold-out audiences of all ages on Broadway and in London’s West End. The Wall Street Journal says, “The makers of Matilda have done the impossible—triumphantly! It is smart, sweet, zany and stupendous fun.” Bloomberg News wrote, “Welcome to the deliriously amusing, heartwarming, head spinning world of Matilda The Musical. You won’t want to leave.” Matilda is produced by the Royal Shakespeare Company and the Dodgers. 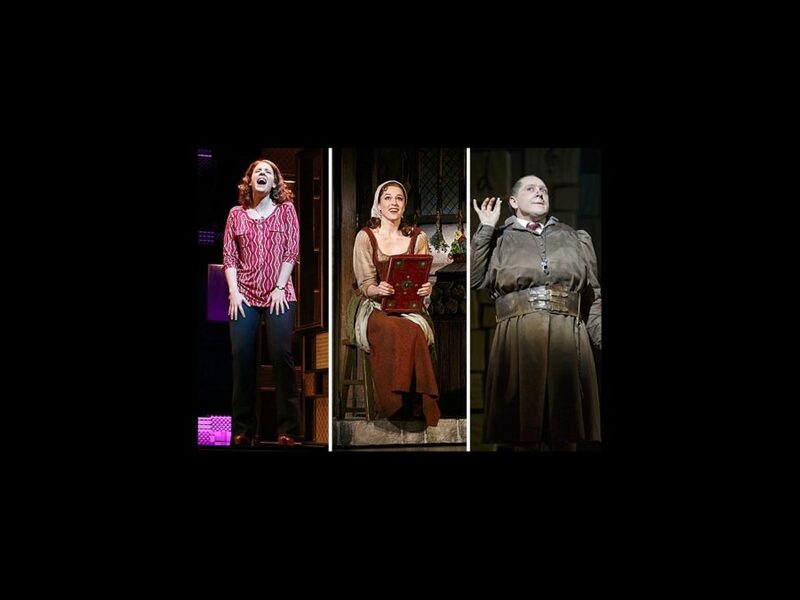 If/Then is a contemporary Broadway musical about living in New York today—and all the possibilities of tomorrow. With unforgettable songs and a deeply moving story by the Pulitzer Prize and Tony Award-winning creators of Next to Normal, this “fascinating, ambitious, and original new musical” (New York Post) simultaneously follows one woman’s two possible life paths, painting a deeply moving portrait of the lives we lead, as well as the lives we might have led. For more information about the series and the benefits of being a subscriber, click here. We hope to see you at the Lexus Broadway In Boston series!